There are ever-increasing customer service expectations on water wholesalers and a growing need to demonstrate appropriate and scalable alternative water supply solutions. Water Direct is a collaborator, working as an active partner with water wholesalers to ensure there are appropriate plans in place to manage water supply incidents, including adequate contracted levels of response and effective escalation plans. We encourage our wholesaler partners to be proactive in planning alternative water supplies in advance, including bottled water and pre-arranged tankers to be provided to areas of need during an incident. 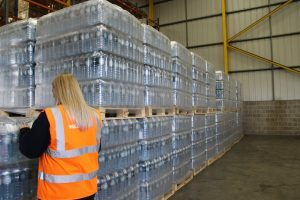 The cornerstone of Water Direct’s contracted services is the innovative and unique Nationwide Bottled Water Bank, a quality assured, rotated stock currently standing at over 3.5 million litres of bottled drinking water for emergency use. The stock is stored, managed and deployed from more than 20 locations across the UK to enable swift delivery wherever and whenever it’s needed. Water Direct’s Senior Wholesaler Relationship Manager Rob Allan talks about the service, its unique scalability and the ways that it benefits our contract partners. What is the Nationwide Bottled Water Bank and why does it exist? 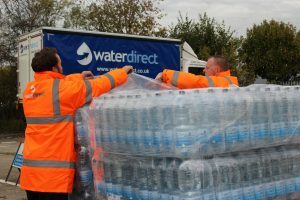 Water Direct’s Nationwide Bottled Water Bank is a significant stock of quality assured bottled drinking water for emergency use, managed and deployed by Water Direct and located at a number of strategic locations across the UK. We created the Nationwide Bottled Water Bank model to meet the needs of numerous contracted clients; to reduce their costs, remove the issue of stock expiry and improve delivery times in all areas of the UK. Regulated by the DWI (Drinking Water Inspectorate), bottled water that is provided as an alternative to the usual piped supply needs to conform with Water Supply (Water Quality) Regulations. Water Direct can demonstrate conformity to these standards like no other alternative water supplier, through unique monitoring, control and sampling systems with continual testing carried out by UKAS accredited laboratories. In addition to the 3.5 million litres worth of physical stock stored at those nationwide locations, providing WS(WQ) compliant bottled water really sets Water Direct apart from the rest. Our wholesaler partners typically use the Nationwide Bottled Water Bank stock to fulfil their requirements against the Security & Emergency Measures Directive (SEMD). Each bank member invests in half the quantity of stock they require creating a ‘deposit’ in the bank and Water Direct matches this deposit, meaning bank members have access to their full requirement when and where they need it, without having to buy it outright beforehand. This stock, combined with Water Direct’s commercial stock creates a large reserve stored across numerous locations nationwide, ensures prompt response in the event of an emergency. Currently, and at any one time, Water Direct’s Nationwide Bottled Water Bank holds a stock of more than double its contracted amounts. This means we have the capability to not only meet all our partners’ full requirements but have the resilience to escalate the provisions in the following days. These contracted volumes aren’t a one off, it’s an ongoing promise to provide the full contracted amount every day, until an alternative supply is no longer needed. This innovative structure supports our water utility customers to enable continuity of provision and to meet exacting SLAs, minimise customer disruption and avoid fines. The Nationwide Bottled Water Bank was designed to deliver a scalable, resilient solution. As more partners join the bank, it creates industry-wide resilience, enabling Water Direct to guarantee contracted volumes, even when national demand is at its highest. Being a Nationwide Bottled Water Bank member removes the issue of stock expiry as stock rotation is carefully managed by Water Direct, as well as reducing cost, mitigating the need to purchase, store and organise 24/7 capable transport. This unique concept also mitigates the effects of panic buying during supply interruptions, delivers peace-of-mind to contracted customers and provides a robust solution for water utility companies looking to underpin their local response plans (LRPs). Over more than two decades, Water Direct has worked to understand the scale of challenges faced by our partners. We know that these challenges are fluid and dependent on regulations, geography and the ever-changing expectations of their customers. We’ve developed a flexible and comprehensive portfolio of alternative water supply services that work together to meet the specific needs of each contract partner, with the ability to adapt, evolve and scale as demand dictates. We operate a truly 24/7 service every day of the year, with trained and experienced incident managers available at all times. Having multiple storage location across the country allows us to provide swift response to our partners no matter where they are located in the UK. We can, in addition, deploy our emergency pods which provide essential equipment needed on site whilst setting up bottled water handout locations during an interruption. We can also offer doorstep deliveries of bottled water to vulnerable customers as an extension to our bulk deliveries. On top of our Nationwide Bottled Water Bank we also operate the UK’s largest commercial fleet of dedicated drinking water tankers. This year we’ve implemented a multi-million-pound investment strategy which has seen the company significantly grow its state-of-the-art tanker fleet, complete with unique self-regulating and remote pump technology, these are designed to deliver network injections; useful to help our clients meet reduced supply interruption targets. Our varied and dynamic offering allows for our contract partners to pick their own bespoke alternative water supply package, depending on their precise needs and what works best for them. What about the environmental concerns of plastic bottled water? We recognise the potential environmental impact of waste from plastic water bottles which are a necessary element of our services. We’ve taken positive steps to ensure we minimise the impact of our activities on the environment. These include ensuring active stock rotation in order to avoid unnecessary waste, and the development of innovative solutions so that customers always have alternatives to consider. We are actively working with our producers to increase the use of recycled material in packaging and are proud to be ahead of the 2025 industry deadlines for two key recycling targets already. Every bottle we provide is already 100% recyclable. This makes it that much easier for the end consumer to dispose of waste correctly and we actively encourage our customers to recycle. Two-thirds of our bottled water suppliers have already moved to at least 50% recycled material or more and we will continue to work with our remaining partners to stay ahead of the industry targets that have been set out. Over the last 22 years, we’ve experienced all the ups and downs that the water industry has experienced, and we have learnt greatly from the significant incidents and increasing customer service demands on wholesalers. As an example, the big thaw in March 2018 following the Beast from the East and Storm Emma resulted in almost all contract customers contacting Water Direct simultaneously as thousands of homes and businesses were left without water. In the week following 3 March 2018, Water Direct was called upon to provide four million litres of bottled water and we mobilised more than 200 truckloads of drinking water. Working around the clock, we provided bottled water via designated water collection points, mobilised drinking water tankers which pumped more than seven million litres directly into the mains and reservoirs to help restore supply, we arranged doorstep deliveries to vulnerable customers and pressurised mains so that leaks could be found and repaired. The challenge is to align unexpected demand with predicted demand to ensure true resilience; we can only do this in collaboration with the water wholesalers and our other contracted partners. It’s incredibly important that our bank members increase their stock in the Nationwide Bottled Water Bank, as their requirements grow. It’s a very flexible membership which can allow for temporary stockholding to prepare for predicted busy periods due to occurrences such as extreme weather forecasts. Water Direct is dedicated to investing in the resilience of the Nationwide Bottled Water Bank, which ensures it continues to expand, by increasing our physical stock as contractual commitments grow. It’s a means to truly collaborate with our partners to manage risk now and in the future by collectively increasing resilience measures. My advice to wholesalers is to carefully consider the scope and scale of their alternative water supply plans. Is your plan robust enough to be able to cope with extreme weather situations such as the Beast from the East? The whole industry needs to ensure it’s doing everything it can to ensure adequate emergency supplies are in place.